Expand search to view more listings in and around Winston Salem. 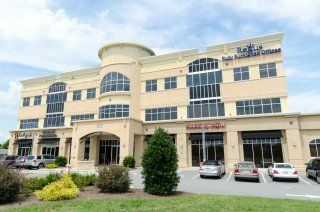 See more offices in and around Winston Salem. Offices.net is pleased to present 1 exceptional office building, situated in a highly sought after Winston Salem, NC location. These offices are available on flexible rental terms with the option for immediate access and all the services you wish to choose. The economy of Winston-Salem is based on furniture, tobacco, textile and high-tech industries. Some of the large companies which have headquarters in the city include Krispy Cr�me Doughnuts Inc., R.J Reynolds Tobacco Company and the TW Garner Food Company. Finding the ideal location which allows you to grow and also to build the right network of connections can be both a challenge and an opportunity. Many companies choose flexible office solutions, which allow them the freedom to expand or contract depending on their changing requirements. Many of the business centers listed on Offices.net come inclusive of an outstanding array of support services consisting of dedicated front desk reception and building security, conference suites and lounge areas, dining facilities and break out rooms. On top of this, numerous office buildings also include high speed internet and network wiring, parking spaces, all-hours access and onsite IT support staff. Choose any of the well situated Winston Salem offices for rent listed on this page. The office space and executive office suites on Offices.net are located in prime Winston Salem business areas, and are available to rent on competitive, flexible terms to suit your exact business needs. Offices.net also offers a broad range of office space in other prime North Carolina locations, available on flexible terms. Get in touch today, and we will be be happy to help you find your exact office space.